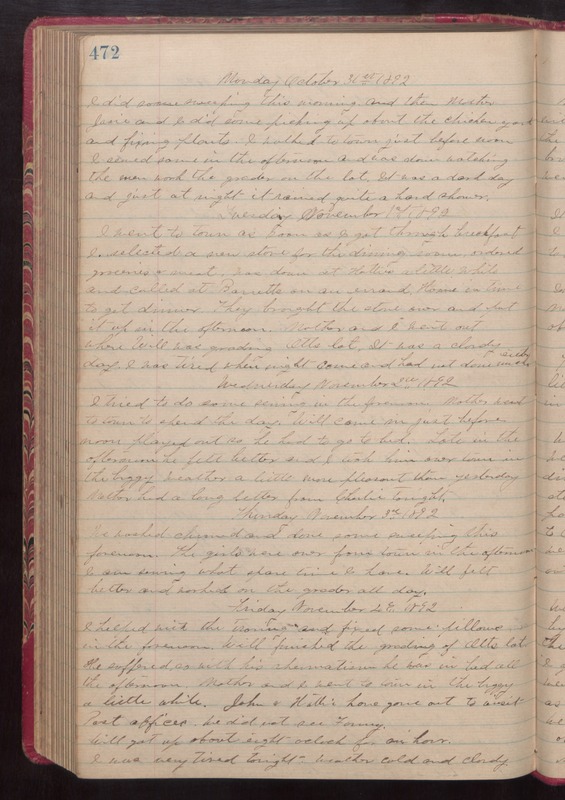 Monday October 31st 1892 I did some sweeping this morning and then Mother Josie and I did some picking up about the chicken yard and fixing plants. I walked to town just before noon. I sewed some in the afternoon and was down watching the men work the grader on the lot. It was a dark day and just at night it rained quite a hard shower. Tuesday November 1st 1892 I went to town as soon as I got through breakfast. I selected a new stove for the dinning roon, ordered groceries & meat, was down at Hatties a little while and called at Barretts on an errand. Home in time to get dinner. They brought the stove over and put it up in the afternoon. Mother and I went out where Will was grading Otts lots. It was a cloudy day. I was tired when night came and had not done much either. Wednesday November 2nd 1892 I tried to do some sewing in the forenoon. Mother went to town to spend the day. Will came in just before noon played out so he had to go to bed. Late in the afternoon he felt better and I took him over town in the buggy. weather a little more pleasant than yesterday. Mother had a long letter from Charlie tonight. Thursday November 3rd 1892 We washed churned and done some sweeping this forenoon. The girls were over from town in the afternoon. I am sewing what spare time I have. Will felt better and worked on the grader all day. Friday November 4th 1892 I helped with the ironing and fixed some pillows in the forenoon. Will finished the grading of Otts lots. He suffered so with his rheumatism he was in bed all the afternoon. Mother and I went to town in the buggy a little while. John & Hattie have gone out to visit Post offices. We did not see Fanny. Will got up about eight oclock for an hour. I was very tired tonight. weather cold and cloudy.